This image shows someone reminiscing of a restaurant where the most delicious cakes were served many years ago. And like in the old photograph, nothing really has changed (don’t ask me where I came up with this, even I don’t know). The cake in the picture by the way, is inspired by the "lemon cheesecake" which you get at Odyssey in Chennai. The drawing was done in pencil. I tried to colour this but wasn’t able to come up with anything that looked good. In the end I decided to leave it black and white (just gave it a bit of sepia-ish tint on the computer). Comments welcome! On an unrelated note, I watched Pudhupettai (Survival of the Fittest) in the theatre today. I liked the first half but the film became draggy and unfocused in the second half. Yet another drawing from me! This is a drawing of Tamil film actor Surya, and was done for a colleague of mine at office (she is a big fan of Surya’s). A photo from the movie Ghajini was used as reference. Did this in pencil, then scanned and added some colour on the computer. I think this has come out pretty well. EDIT: 9:49 AM: I noticed a flaw in the drawing (there was less hair on Surya’s right, due to which the shape of his head looked unrealistic!! ), which I corrected. Because of this, I had to scan the image and colour it all over again. In the end though, this turned out far better than the original colouring job, so I’m happier with the result! This week’s topic at IllustrationFriday.com is Sorry. By the way, the character names come from A Better Tomorrow and its sequel, and Bullet in the Head is a great John Woo movie. This picture was done in pencil and ADD Gel ink pen. The car was taking away attention from the people in the picture so I lightened it (and applied a "color halftone" effect) in Photoshop. The red blood-splatter was also added digitally, as were the other touches of colour and text. I tried a few new things in this picture. Firstly, there are more characters than in my usual drawings, and a better (in my opinion) use of perspective. Also I think this is the first time I’m drawing a car. Thanks for the Birthday Presents! Yes, it is officially now my birthday (May 15), and I’m 24… Wanted to say thanks to all those who called and wished me today. Got a couple of cool presents. Varun mailed me a Birthday Card with a edited photo of myself and a System of a Down song in the background. Awesome editing on his part, though that’s to be expected, isn’t it! And Pablo sent me a couple of his unreleased Doom II maps (I remember some five years ago when I received his Red Evil map as a birthday present)  I played both (one is an extended version of the other) and had fun. Good stuff! Watched the Sanjay Dutt-starrer Tathastu (…So Be It) and came back home. As you can see, this is a faux movie poster done comic-book style! I drew this in pencil, then scanned it and coloured it on the computer, and added the text. The fonts used are "Cocaine Sans" by Chris Hansen and "Typewriter – a602" by Mr. Fisk. I started drawing at around 8:30 PM, and finished the whole thing about half an hour ago (of course, I went out for dinner in between it all). I think it came out pretty well  I am getting better at anatomy (though there is still a LOT of improvement possible! ), and I am happy with the concept of the picture. Inspirations include the character Gabriel from Constantine, John Woo movies, Mike Mignola’s Hellboy and Mr. and Mrs. Smith. And if you’re wondering how Angela can put on her suit with her wings, I’ve got an explanation: her wings are magical, so they wouldn’t create a problem. I am thinking of participating in this tomorrow. Let’s see what the topic is, I will draw something based on it and post it here. Told Varun about it too, probably he will participate as well. Well, I am on Level 20 now and I am going mad. 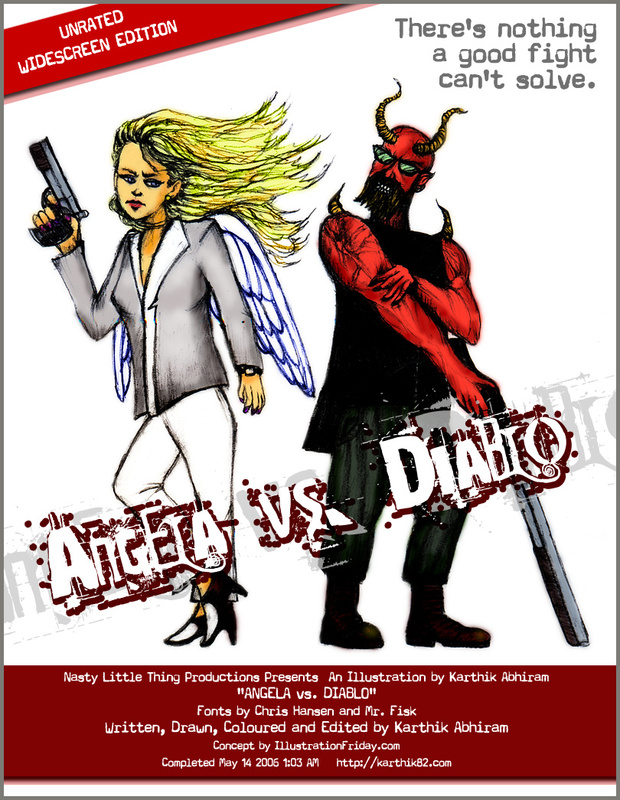 EDIT (13 May, 10:20 PM): Had a look at the theme for Illustration Friday at office yesterday  it’s Angels and Devils. And today I did an illustration based on this. The pencilling is almost complete, after that is done I will scan it and colour it on the computer. That will be the next post here. Taxi No. 9211 falls in the first group, as it’s a very well made, well acted and directed movie. I just watched this on DVD  it’s from the makers of Bluffmaster, and is even better than that film. It begins with a narration provided by Sanjay Dutt, introducing us to the central characters of the film. Raghav Shastri (Nana Patekar) lives in Mumbai with his wife (Sonali Kulkarni) and child, and is unable to make ends meet (in fact, he owes more than Rs. 30,000 to the man who runs the taxi service). He has switched 23 jobs in 15 years as he is unable to get along with anybody. He works as a cab driver, but lies to his wife that he’s an insurance salesman. Jai Mittal (John Abraham) is the son of a wealthy businessman. But Jai is now in a situation that could change his life forever  when Jai’s father died, he left all his wealth and possessions not to his own son, but to another businessman. However, Jai has in his possession another (presumably, earlier) will written by his father, leaving all his wealth to his son (I didn’t know this was possible). Jai must produce this document in court in order to claim the wealth. The morning he is due to appear in court, Jai has to go by cab. He has to pick up the will from his bank vault, and then meet his fiance Rupali (Sameera Reddy) and lawyer in court. As fate would have it, it’s Raghav’s cab (the titular Taxi No. 9211) he gets into. He goads Raghav to drive faster, giving him money to skip traffic signals. Unfortunately an accident happens, and Jai leaves the scene and goes off to the bank  only to discover that his vault key has fallen into the seat of Raghav’s taxi. Thus begins a "war" between Jai and Raghav  Jai is desperate to get the key from Raghav, Raghav loathes Jai and his kind, and will do anything to taunt him (but stands to lose his family in the process). What will happen at the end of it all? Taxi No. 9211 is written by Rajat Arora and directed by Milan Luthria. As I mentioned earlier, the acting is very good (Nana Patekar is awesome), and an urgent, almost intense tone is maintained throughout. While the movie begins as a comedy, it certainly is very dark at times. Thanks to a good script, the blending of serious/comedic tones is pulled off very well  this maintains the viewer’s interest and serves as a very interesting character study. The movie takes inspiration from the Ben Affleck/Samuel L. Jackson starrer Changing Lanes, which I haven’t seen. I don’t know how much similarity is there between the two movies, but from what I’ve read, the two movies seem to be largely different. Anyway, I really enjoyed Taxi No. 9211. I started using a new notebook today. And as is customary, the first page has to contain a drawing of mine (of course, the book is still going to have many doodles and drawings at random locations! ), so I decided to have one of Fight Club. 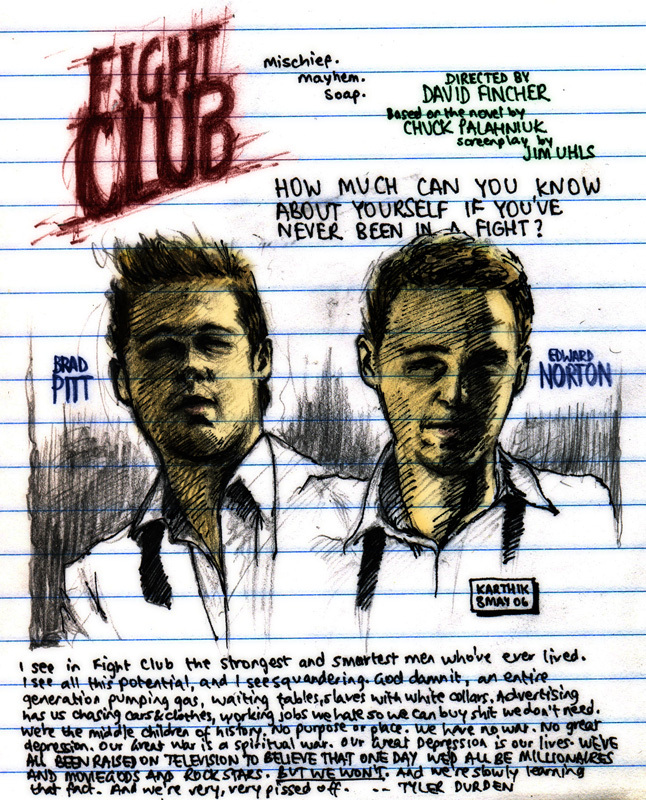 Why Fight Club? Well, besides the fact that it’s one of my all-time favourite movies, my cousin Balaji and myself were discussing it over the last few days. Also I had my DVD outside and was watching some of it today. The drawing seen above was done in about 45 minutes or so. I used pencil and an ADD Gel pen (black) to draw it. The pictures of Brad Pitt and Edward Norton on my DVD (the printing on the disc) were used as reference. All colouring was done in Photoshop, and that took an additional 15-20 minutes. I know this is not one of my best images, still, I am pretty happy with the way it came out. Am experimenting more with colouring on the computer now, though I am not very good at it (plus, having to use the mouse for this is a real handicap). Pictured above: some recent (and older) purchases. On Saturday I bought this book called History and Techniques of the Great Masters: Rembrandt by Andrew Morrall. On top of that, you can also see the Rang De Basanti VCD which I bought. Yet to see it though. The VCD of My Wife’s Murder was bought about a week ago. And then, there is the DVD of Fight Club, which I bought in January. In the picture is the outer cover, which looks like a package wrapped in brown paper, the actual DVD case, and the second disc, containing the supplemental material. The post title is the tagline for Ice Age 2 which I watched yesterday (wish I could come up with something that clever…). I went to Pallavaram to visit my cousin Ashwin and his parents yesterday, and we watched the movie in the evening. I have been meeting relatives over the last few days. Last Thursday was my cousin’s wedding, and on Friday night I had gone to my uncle’s place in Thiruvanmiyur. Spent Saturday there. It was really nice to spend time with my cousins. Today is the last day of the "long weekend", and so far the day has been spent doing random things in front of the computer (reading on the net, even a bit of IM chatting with my friends, downloading stuff). Personally I think this is a really good way to spend a holiday  having nothing planned, just sitting in front of the computer and letting the hypertext take you where it wants. Randomness is good. I am now planning to download some movies from the Internet Archive. Roger Corman’s 1963 The Terror finished downloading about half an hour ago. EDIT: 5:39 PM: Movies that I plan to download: The Lost World (1925), M (1931), The Last Man on Earth (1964). Currently downloading is D.O.A. (1949).